There are certain cars that although they sound and yes, even look impressive, can create a certain ego-draining frustration as you attempt to climb down and into the driver’s seat like an out-of-practice young contortionist from Cirque du Soleil. 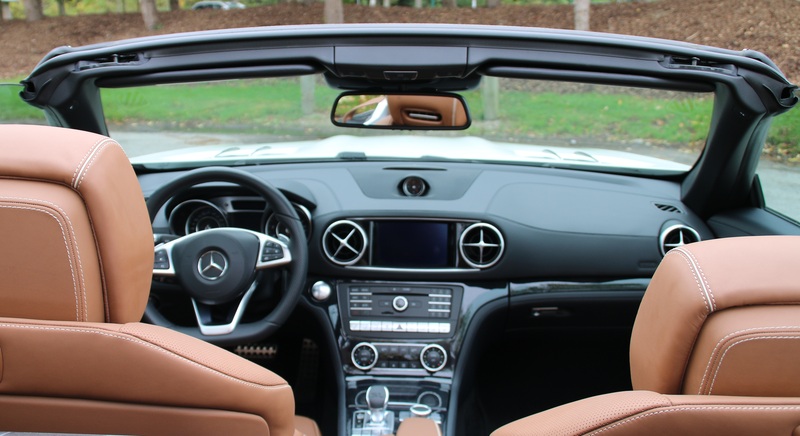 We’re talking convertibles, a.k.a. rag tops, drop tops or, in a few instances, a roadster. Generally speaking, such vehicles can command a higher than some sticker price—seldom do they live up to that “value”, perceived, or otherwise. 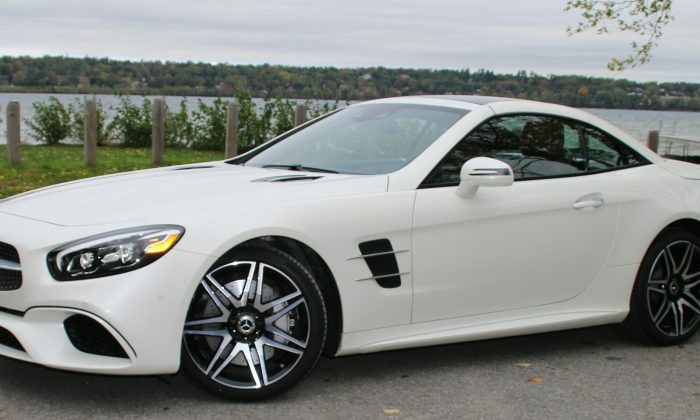 However, I recently had the good fortune to drive a Mercedes-Benz SL550 decked out with a Diamond White Metallic multi-layered coat of paint, which from day one driving impressions, managed to convert a long time sports car skeptic with apparent ease. This is, indeed, a roadster, one which can be driven anywhere with pride of ownership. The interior is all elegance, hand-stitched leather dash, genuine fine wood trim, and the use of aluminum accenting. Make no mistake, the manner in which Mercedes-Benz has optioned out this particular driving machine put the final price tag just north of $140,000 and while this might be too rich for my personal budget and lifestyle, I could absolutely appreciate just about everything that German engineers has built into this two-door hard-top convertible. How could you not love a car which gently yet with authority, cradled you when negotiating turns? This car gave hugs! OK, so it’s not really a hug. Active seat bolsters press softly into your corresponding side, in absolute sync with the vehicle’s steering. Consequently, “holds” you in your seat, as corners come and go. The first time you experience this, it’s a little off-putting–like being surreptitiously touched when it’s not expected. However, allowing this feature to assist you in driving, you will feel less tense, more relaxed when your final destination is reached: technology has saved you from potentially overusing certain back muscles as your body attempts to follow the lines of the car while driven. You may end up at your destination feeling more relaxed than when you left your home or office! So yes, this car is extremely comfortable. Just about every feature you might desire is either at your fingertips or is built into the car itself. One of the most satisfying attributes are the climate-controlled, 10-way power adjustable front seats with power lumbar adjustment. And of course, the cuddle feature. Perhaps the most important component of this true roadster is the engine. And what an engine M-B engineers have placed under the long, easy to see over hood. This tested SL550 was commanded by a 4.7 L V8, twin-turbocharged for 450 horsepower and 516 lb.-ft. of torque. This torque output is truly amazing and makes the V8 a more than willing performer. Apply gentle pressure on the throttle and the SL550 will respond effortlessly, eagerly awaiting your next action. Adept in the city, but so at home on highways and country roads, the SL550 will never leave you feel wanting. In fact, with the new nine-speed automatic, the SL virtually idles along—even when driven with firm purpose. Do not confuse this car to other German sports performance models: this is not all about raw power and handling. The SL550 is perhaps a little more refined, more “gentlemanly”—refined power with manners—if you will. Naturally, it’s also for women too, should they be so inclined, but European manufacturers know their sweet spot is generally a testosterone-fuelled demographic. The SL550 in its various sportier modes, responds more quickly, urgently, and even a bit more athletically to driver-oriented input. The steering is more crisp and direct than you think when pointing the SL around sweeping bends. However, do remember, this car is not intended to impress as a high-precision track-oriented machine. 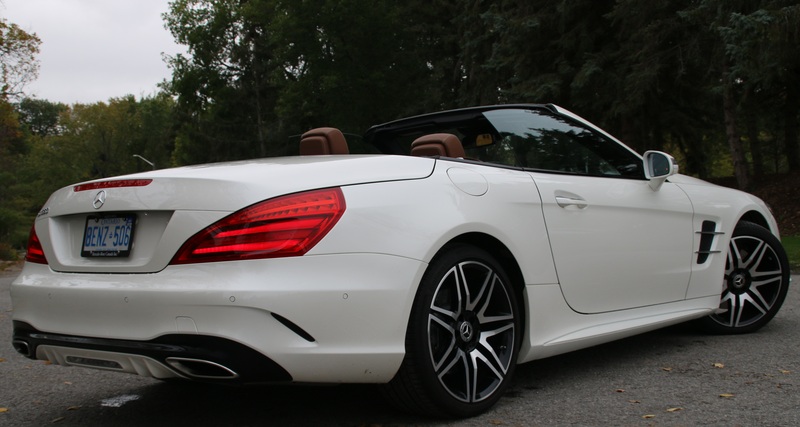 This is more of an impressive long-haul luxury drop-top. And let’s talk about the drop top, converting this hard top into convertible mode. While it’s safer to engage the power-folding top when the vehicle is actually stationary, it may be accomplished—up or down—with the car driving at up to 40 kilometres per hour! Throw in many standard active and passive safety features to keep the two occupants protected, and Mercedes-Benz has another car designed for drivers, and demanding to be driven. Equipped with Active Brake Assist which autonomously brakes the car in the event the driver doesn’t brake in time and other optional systems include the Driver Assistance Package, which features Distronic Plus with Steering Assist, Blind Spot Assist, and both Pre-Safe and Pre-Safe Plus systems, this is a car which may appeal to aficionados and even enthusiasts alike. Body Style: Two-door convertible with power-folding drop top. Engine: As tested, 4.7 L V8, twin-turbocharged for 450 horsepower and 516 lb.-ft. of torque. Fuel Economy: (stated): (Premium) 13.6/9.5/11.7 L/100 km city/highway/combined. *Does not include freight. PDI, HST, and other taxes extra. David Taylor is an independent automotive lifestyle writer, producer. and editor based in Barrie, Ontario who is fascinated by innovation and technology which enhance the overall driving experience. He’s also a member of the Automobile Journalists Association of Canada (AJAC) and a Director of the Canadian Car of the Year. Follow him on Twitter @Omemeeozzie or on Instagram @hugoscaroftheweek.